It's always a pleasure to hear music from my local area, but it is double the pleasure to hear a prog band that is close by me. Akronites Maid Myriad were introduced to me by an old school buddy, and I'm certainly glad he got me into connection with them. Maid Myriad is self-described as kaleidoscope rock, of which prog rock is but one part. Indeed, this band has many influences and ideas; and their new, three-song EP shows this in spades. The new EP, “Camera Eye”, features three excellent rock songs that will give some taste of a full album that is due out later this year. The band plays a style of rock that feels indie, proggy, alternative, and fresh all at the same time. Indeed, they sound very much like The Dear Hunter mixed with The Mars Volta with a touch of Incubus. This interesting band utilizes a very high, piercing guitar tone that is molded into some great sideways lines and some very interesting instrumental interplay. Yes, the technicality of this album is probably at a medium level. In fact, the drummer plays like he has more than two arms sometimes. The vocals recall the emo movement a few years back, but not completely. They have a little bit of whine to them, but they tend to be beautiful and melodic consistently. In fact, the singer hits some great notes, especially on “Camera Eye” that are very impressive. As for favorite tracks, however, I think “Azure Plains” takes that. The groovy style and the fantastic structure touch my prog heart. As a preface to their soon-to-be-released debut album, “Camera Eye” is catchy, geometrically ambitious, and accessible to a comfortable point. 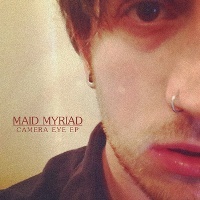 Soulful at times, hard rockin' at others; Maid Myriad has left me wanting to hear more from them. Yep, this EP is just too darn short. I hope the debut album has this same level of quality.